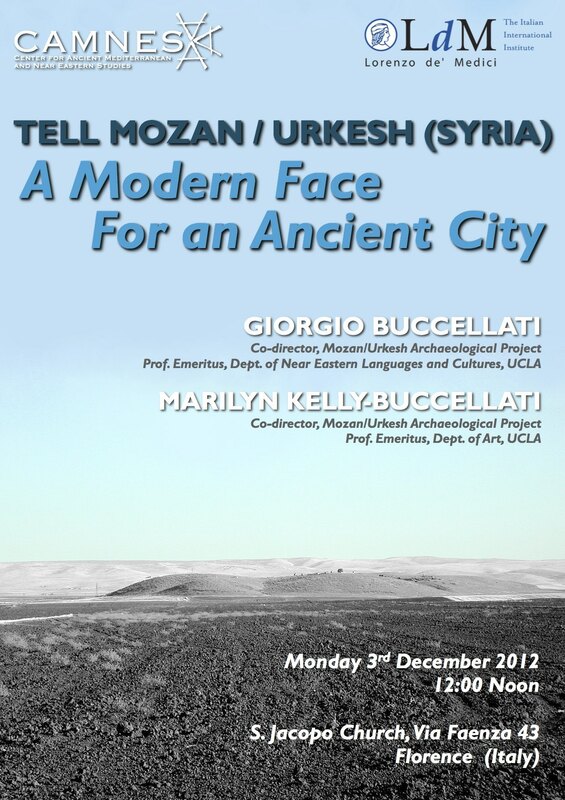 The excavations of the site of tell Mozan have been conducted by the UCLA archaeologists Giorgio Buccellati (who is also a member of the CAMNES scientific committee) and Marilyn Kelly-Buccellati since 1984. Tell Mozan is the site of the ancient city of Urkesh – which was known from myth and history, and which the excavations have firmly placed its location in northeastern Syria. Its beginnings are yet unknown, but they date back at least to the early phase of the 4th millennium B.C. It was a main center of the Hurrians, who celebrated it in their myths as the home of the father of the gods, Kumarbi. It was also the capital of a kingdom that controlled the highlands immediately to the north, where the supplies of copper were located and that made the city wealthy. Highest on its horizon is the temple of Kumarbi, dating to about 2400 B.C. The name of the king who built it – Tishatal, is known from two magnificent bronze lions. The temple stood on a vast terrace: only portions of the monumental revetment wall and of the even more monumental staircase have been brought to light – enough, though, to give a sense of the spectacular choreography the ancients had been able to create. Another important building discovered by the archaeologist is the ancient Royal Palace. In its present form it dates to a time slightly later than the Temple, about 2300 B.C. Only the service wing has been fully excavated, while the formal wing, where the king lived, extends far under the later settlement. A large number of seal impressions have given us a wealth of historical information about the Hurrian dynasty that ruled the city and about the queens who hailed from the south, including the daughter of Naram-Sin, the powerful king of Akkad who conquered the rest of Syria, but remained allied to Urkesh. A most remarkable structure is a large and deep stone pit where the spirits of the Netherworld were summoned by a medium, capable to interpret their chirp-like voices. Awesome because of the intense religious meaning it carried, the structure still has a profound impact on the visitor because of its monumentality, perfectly well preserved. Starting from the excavations at this archaeological site, the plans envisage a large Eco-archaeological Park that will cover 54 km2 and include 20 modern villages. The area is conceived as a cultural district, where the heritage sites will be used as stepping-stones for the creation of capabilities in an integrated economic development, empowering local communities and planning preventive archaeology. The Park is conceived as a cultural district and a living experiment in the field of planned conservation and preventive archaeology. The new economic model is based on: (1) conservation as a part of an overall economic plan; (2) concept of use and non-use value as key components; (3) and uncertainty as one of the basic variables. The innovative archaeological approach proposes to study the entire area that revolved around the Park. The interdisciplinary dimension of the project aims to integrate the economic approach with the management of heritage sites. The Park will be the first large scale interdisciplinary research project in the region, combining archaeologists, historians, architects, engineers and economists, on the complementary relation between archaeology, tourism, agriculture and local services. The archaeological project aims to preservethe site by proposing pro- environmental actions, such as the following ones: (1) strengthening the national regulation (2) attracting financial incentives. The Environmental Conservation would avoid that the site is threatened by industrial structures, as it has happened to many other archaeological sites. Plans are under way for the development of the Park to be under the control of the Urkesh National Trust (UNT), a non- governmental agency.